CAN I VISIT THE HOTEL? The simple answer to the question is “No” as the building used in the series was not a hotel at all. 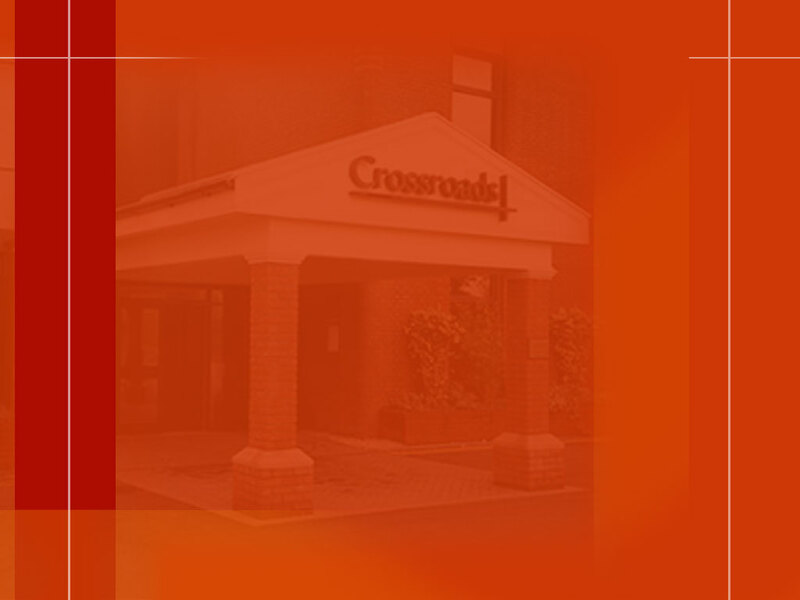 The 2001 series of Crossroads was made by Carlton Television for the ITV network. The hotel interior and exterior were filmed in Nottingham at the now closed Lenton Lane Television Studios. 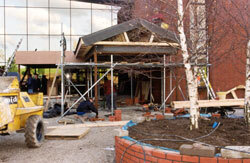 You can find out more about the construction of the exterior set in the FEATURES section of the site. Since the end of the series most traces of the exterior have been removed and the building sold to the University of Nottingham. All that remains of “the hotel” now is the brick tower (which actually houses a staircase), the raised flower beds and the circular flowerbed / traffic island – although these are in a poor state of repair. The canopy was removed shortly after filming ceased although there is still some block paving showing its location. The exterior set under construction. You can see photographs of my set visits by clicking on the FEATURES menu. CAN I VISIT KINGS OAK? King’s Oak is a fictional village though the locations used are real enough. Various different villages around Nottingham were used to double up for the exterior scenes including Bingham and Redmile. You can find out more about some of the real-life locations used below. The minutes from the Redmile Parish Council meeting held on Monday 13th November 2000 describe the complicated process involved in filming (relatively few) scenes outside the confines of a TV studio. A public meeting was called by Carlton, and held on 17th October at the Windmill Inn to discuss filming in the village. The meeting was attended by between 70 and 80b residents. There was "overwhelming support" for the project, with only 2 residents raising any concern. The council had been assured that off road parking would be arranged and that the police would be consulted. It was also stated that there would be no road closure. Filming was scheduled to start on 29th November 2000, with Carlton agreeing to pay owners for the use of their buildings, and to make a payment to the Parish Council for the village as a whole. At least one councillor asked that the payment should be spent for the benefit of Redmile, and this was agreed. So everything was fine....? Not if you read the "Newark Advertiser" which claimed there had been a "Row over soap shoot"
Sharon Hodgkin reported that the plans "have angered residents who fear that filing would infringe on their privacy and village life would be disrupted both by filming schedules and tourists." "Representatives from the programme makers, Carlton Television, met with residents on Tuesday to outline their plans and discuss any concerns but they failed to placate the villagers and the entire community will now be balloted to decide whether to co-operate with the company." "A spokesman...said "I should think 98% of the programme will be done in studio in Nottingham and only a very small part will be filmed on outside locations."" The minutes from the Parish Council meeting from 8th January continue the story... Two residents asked for an update on Crossroads filming, and complained about restriction of movements during filming. The police confirmed that they had received two letters of complaint but were satisfied that traffic flow had not been interrupted. The minutes also state that Carlton had paid for police attendance to control traffic and anticipated crowds. If you have any other information about locations then do get in touch using the address at the top of this page.